It’s hard to argue that if you’re going to be out in the woods hoping to take a deer or turkey, you should really be up in a good tree stand. Tree stands and other types of deer stands are extremely popular, and it’s no wonder considering how light, portable, and safe they’ve become. But there is a lot to be said for a well-placed and brushed in a ground blind. A ground blind is far easier and more convenient and easier to set up and climb into. This makes them excellent choices for hunters with physical issues that make shimmying up a tree too dangerous. Comfort is a major consideration with newer hunters, and you’re generally more comfortable on the ground. They won’t be confused with learning about how to use a tree stand when they should be focused on the hunt. If you’re taking out a youth hunter or someone who’s hunting for the first time, a ground blind is certainly the best way to introduce them to the sport. Ground blind hunting is a simpler, a back-to-basics approach, and there are some situations when it can actually be more productive than a tree stand. It all depends on the area where you’re planning to hunt. Let’s take a look at how to effectively use ground blinds for both deer and turkey hunting. Set up Your Ground Blind Ahead of Time – Deer will certainly notice any changes in their environment, and they’ll shy away from anything different at first. Eventually, they’ll get used to it, but it takes some time. Ideally, you should have several blinds set up in different areas to take wind conditions into account. Get Familiar – Not only should you set up your ground blind early in the year, but you should spend some time in it too. This is just good pre-season scouting sense, you’ll learn what you need to do to stay comfortable, and what the woods look like from your vantage point. Make your Blind Invisible – Surround your spot with branches with the leaves still on them, brush, logs, anything to break up your outline. Just make sure you can shoot over your cover. Give Yourself Shooting Lanes – Clear out the brush and small trees around your blind to give yourself a clear shot in the places you expect the deer to be. Again, do this well before the season starts so the deer can get used to the changes. 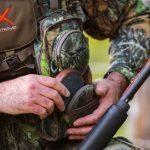 Get Isolated – There are times when other hunters moving in the woods can be an advantage, and if you can get out early they might drive the deer towards you while they’re getting in their stands, but later in the season the deer will have become wary, and they’ll be moving in the more isolated locations. Try Decoys – They can be very effective during the rut, especially when there are more bucks than does in an area. Setup Near the Roost – Scout early in the morning, just after dawn, and you should be able to see and hear them coming down off the roost. Also look for the distinctive J-shaped stools turkeys leave under trees. Find where they Feed – Turkeys love fields, pastures, and ridgelines, and of course corn and soybean fields. If you don’t get them right off the roost, you can catch them while they’re eating. Get Down and Dirty – Turkeys, like most birds, love to roll around in the dust. This helps them to stay clean and dry. Look for areas where they’ve been scratching and disturbing the ground, usually close to their feeding areas. Keep the Sun Behind – This helps to conceal your movements and puts the sun in the bird’s eyes. Turkeys have some of the sharpest eyes in the woods. It’s their greatest sense, and anything you can do to gain the advantage should be used. Blanket – A soft, dark blanket is useful in more ways than the obvious one. Laid on the ground, it will help to deaden the noise from dead leaves and grass. It can also come in real handy if you feel like taking a nap mid-day after lunch. Bow Hanger – You’ve only got a certain amount of room in a ground blind, and fumbling around a bow and quiver full of broadheads can get annoying real quick. A hanger will keep your weapon up out of your way and ready to go at a moment’s notice. They’re cheap, and it’s one accessory that will pay big dividends. Rangefinder – Sure, you may be able to eyeball your shots pretty well when you’re at home, but in the field, it can be an entirely different story. A good rangefinder these days isn’t a huge investment, and it will eliminate a lot of the guesswork in setting up that perfect shot. Good Binoculars – Some hunters feel like they don’t really need them, but when you’re glassing the tree line, being able to catch that little bit of movement or flash of color makes them worth it. Always remember that a turkey can see a whole lot better than you. Seeing them first is essential to turkey hunting success.